Broadbridge Heath have re-signed former Dagengham & Redbridge, Lincoln and Eastbourne Borough striker of 'proven quality'. Jamie Taylor, 36, has returned to the club where it all started after a glittering carreer in both non-league football as well as a brief stint as a professional. Taylor first joined the Bears at 15 years old and was a member of the all- conquering youth team of the late 90s and the first team that narrowly missed promotion to then County 1. He then progressed on to Horsham where along with Lee Carney, who also rejoined Heath this season, became a club legend. Taylor had spells with Aldershot and Working, before turning pro with Dagenham & Redbridge. He then spent time at Margate, Sutton United and Lincoln, before going on to have two stints at Eastbourne Borough. 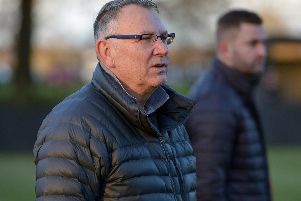 The forward joined Three Bridges at the start of this season, but Heath manager Steve Painter has managed to recapture his signature this week. Taylor is now one of several players at Heath to have graduated through the Heath’s youth system, including Lee Carney, Martyn Flack, Jamie Robinson, Andy Waddingham and Ollie Moore. Painter said: "It is fantastic to have a player of Jamie’s proven quality on board and we hope that he has an enjoyable and successful time as the Bears enter a new exciting era."